These supernatural challenges only make Olivia more determined to speak her mind, and so she’s drawn into a dangerous relationship with the hypnotist and his mysterious motives, all while secretly fighting for the rights of women. Winters breathes new life into history once again with an atmospheric, vividly real story, including archival photos and art from the period throughout. Why did I read this book: Ever since first hearing about the book, I’ve wanted to read it: suffragettes! Gothic fiction! that cover! It’s 1900 in Oregon and Olivia Mead is a young suffragist who dreams about going to college one day. After attending a stage production featuring a young mesmeriser called Henri Reverie who hypnotises her thoroughly on stage, she – embarrassingly – becomes the talk of the town. Her only solution is to go looking for the hypnotist in the hopes that he will help her, but Mr Reverie has motives of his own: his sister is incredibly sick and he desperately needs the money Olivia’s father has offered for his services. The fact that when Olivia looks at Mr Reverie, she only sees a good-natured person at heart, is only part of the problem. 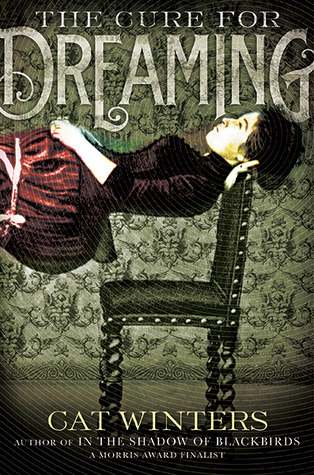 Mixing historical fiction with supernatural elements, The Cure For Dreaming is an atmospheric coming of age story of a young girl torn between family and society, and her dreams of freedom. The most striking thing about The Cure For Dreaming is the lengths that it goes to make the plight of women and their fight for equal rights a physical, literal curse that lives on in Olivia. I am of two minds when it comes to this aspect of the novel. On the one hand, this is an incredibly powerful concept. Women were and still are under constant, unfair scrutiny. The cult of nice, the unyielding recurring belief that one must not express anger is painfully felt by Olivia when she literally cannot express that anger and how it puts her in uncomfortable positions and even physical, immediate danger. On the other hand, I constantly found myself wondering if this conceit wasn’t too…shady and heavy-handed especially when one thinks that even without being under hypnotism, most women have experienced and still do experience the same things as Olivia in a myriad of ways. Misogyny is a reality that often puts women in positions to not be able to express themselves. What the book does is to put it in perspective, to make it more obvious in a way that it’s impossible to question it – which can both be read under a negative or positive light, your mileage may vary. I do feel that the story in many ways lacks finesse and nuance and that is underlined by the fact that most men and women opposed to suffrage are portrayed as caricatured evil villains and the oppressed women as shadowy, disappearing figures with no voice as though people are this black and white, as though women through the ages haven’t lived full lives, don’t live full lives even when oppressed. More to the point: the point of oppression, misogyny and patriarchy is that it’s less open Evil with capital E and more about social mechanisms that spread its tentacles in – more often than not – subtle ways. With that said, it is possible to take the novel’s premise and just run with it. The writing is good and in spite of my thoughts above I actually did really like it. The story plays really well its supernatural elements against this context and the author has included fascinating historical snippets, quotes and photograps. Despite the fact that most characters are one-note, Olivia is a fully-fleshed out character and I appreciated her friendships with other girls, I loved her journey to self-realisation, I adored her romantic relationship with Henri, her budding sexuality and the perfect-note ending. Tag it: I loved it but. How to Be a Fan of Problematic Things. Nothing is Perfect and That Is Ok. Notable Quotes/Parts: You can read the entire first chapter here. Excellent review, sounds like an amazing read.